October 12, 2015 – On October 8, the Space Foundation’s Washington, D.C., office hosted a Space Power Breakfast, with featured speaker Secretary of the Air Force Deborah Lee James. 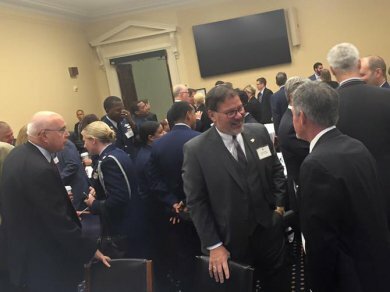 The breakfast was attended by nearly 80 congressional staff, industry executives, and various officials from U.S. government departments and agencies that are responsible for space, plus the Space Foundation’s CEO Elliot Pulham and Board Chairman Lon Levin. In her remarks, Secretary James announced publicly for the first time that she has now been designated principal Department of Defense advisor for space (PDSA). She stressed the dangers that critical USAF space programs face if Congress cannot pass the Fy2016 budget and revert to a year-long Continuing Resolution (CR). She touched on topics such as Space Fence, RD-180 replacement, Counter Communications Systems, as well as how integral our work with allies has become in space. Remarks were also made by Congressman Jim Bridenstine (R-OK) and Congressman Doug Lamborn (R-CO) during the breakfast.